How are you? Did you have a good day today? I really hope it was a great day! Please always stay warm and eat well. I would like to hope you're looking after yourself well. Finally it's almost chuusday! I'm so excited and I can't wait to hear your voice again. Chuusdays are always the most wonderful days ever. Today i didn't do too much too exciting. I'm just keeping on top of my usual work these days and hoping it's enough to keep going forward. everything is considerably tougher than I'm used to but I'm making it all work. This should be the last time i worry about that hehe. Please wish me luck tho coz i want to be able to save to come see you again at the events. Although I'm not sure what your up to these days I'm sure you're working hard so please look after yourself well while you do. not just physically but every way. don't give your doubts too much air time and keep hold of all the love that everyone has for you too. How much we believe in you. The pride we all have for you. Don't let them be chains but instead let them be platforms that lift you higher. And remember that your only limits are the ones you put in your own mind. they don't really exist.. I how you had a really good day yesterday too. I am sorry my posts are coming thru late but I've not been 100% well. I'm not as tired today as i was yesterday but I'm still a bit tired.. I'm going to eat soon though hopefully so i hope that helps. I really do hope you've been having good days lately. I'm not sure at all what you're up to but no doubt you're busy with something. you always are after all. I am looking forward to seeing you again soon with the new drama. You know i wouldn't miss it! I'm certain you've done a good job tho and i can't wait to tell you how good. Still waiting though haha. always waiting sigh..
You're really amazing tho and i hope you know it. I'm proud of you always. Everyone can see how talented you are too which means you should definitely believe me on it.. because it's not just me who says it. whatever it is that you're doing now, I'm sure you'll give it just as much effort and will do it just as well. Remember that you are Shin Wonho.. Think of how proud you'll make everyone and work hard. Because you benefit from that too.. if wanting to do a good job for CandY is the thing that inspires you the most then use that.. if it's something else then use the something else. because whatever inspires you to work hard and do your best is what will carry you the furthest and give back to you the most. And believe in yourself. Believe in your ability to perform.. and your ability to make others happy too... they're connected on some level hehe. I hope you're doing well today. I'm sorry i didn't post last night but i wanted to get lots of sleep.. but i still don't feel like I've sleep enough. I'm still very tired. 일본은 인플루엔자가 유행하고 있으니, 감기 조심하세요. but anyways! I get jelly every winter like this but I still want you to stay warm!! I had a somewhat busy day. It's done now tho so i can finally relax and go to bed. 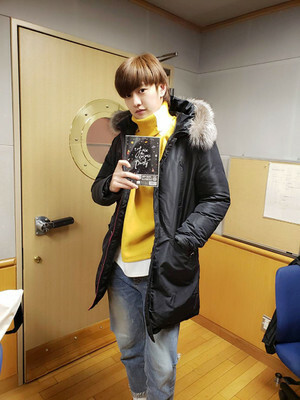 Your radio show last night was really beautiful though.. Shin-kun♡ I enjoyed it a lot. Even when I don't properly understand, just the sound of your voice is healing. I think tho if we look at it as we each start with 100 luck, then I used all 100 on one thing.. and i wouldn't change it.. i would do it again.. it's like saving money to buy something you want.. i saved all my luck for years to get the only thing in life I could ever want. ^_^ I even found many hundreds of 4 leaf covers in my years to add to that luck. kinda like if you want more you have to work for it.. i stockpiled luck and saved it for one big impossible request. so i don't mind never winning another thing ever again for the rest of my life because life blessed me with the greatest gift it could. Please sleep well tonight my hero.